The above info came from Kalene Kon, and was edited by yours truly (contact me). The image came from Anime Guide. 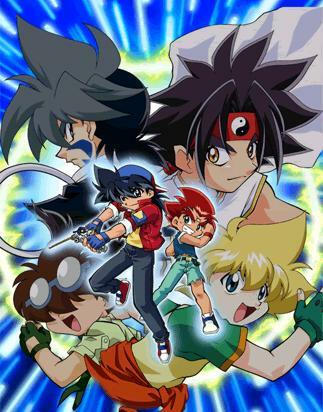 Beyblade G Revolution is the third and final season of Beyblade. The BladeBreakers/BBA becomes seperated, but unites during the second half of the season. Tyson, Kenny, and Hilary are still in the BladeBreakers, Kai is in Neo-Borg...then BEGA, Ray is the White Tigers, and Max is in the All Starz. The characters are more mature (well, some of them) and they face new enemies, like Team BEGA and The Balthez Soldiers. The teams from the first season are also included.